Executive Chef, Armando Navarro, has had a noteworthy resume packed with top restaurants along both coasts. After five plus years as Executive Sous Chef at Auberge du Soleil, Armando went to New York where he trained under some of the best chefs at Le Bernardin, Jean Georges and Daniel Boulud. He returned to California and worked at Jardiniere and Masa’s before relocating to Redd in Yountville as the Chef de Cuisine. 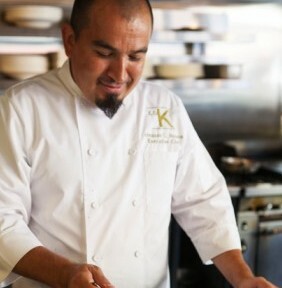 Prior to joining Sonoma’s El Dorado Kitchen, Armando was the Executive Chef at Larkspur Restaurant in Vail, Colorado. In his role as Executive Chef of El Dorado Kitchen, Armando has infused the menus with seasonal ingredients sourced locally at the markets. His style is characterized as fresh, simple and approachable with a Sonoma sensibility.